Phones are ringing off the hook at the front desk – the receptionist is reminding you of all the messages you need to return by this afternoon. You see patients filling the waiting room, glancing at their mobile devices and tapping their feet. Sighing with frustration, you just want to go home to see your family, but unfortunately, you are on call this week. Burnout can occur in any occupation. 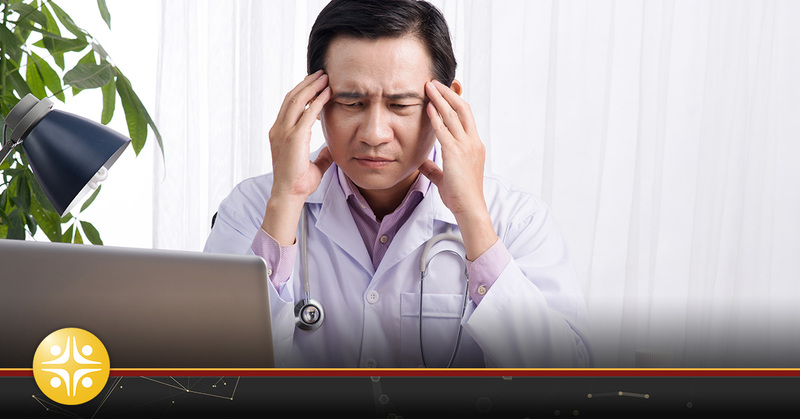 While all jobs include an element of stress, few professions involve as much pressure as those working in the medical field. Long-hours, mounting pressure to see more patients, fluctuating rules set by insurers, a frenzied increase of computerization, and non-patient- centric duties are major contributors of burnout. Yikes… Is it any wonder that you might have trouble coping? According to a 2012 study published in the Journal of the American Medical Association, Physician burnout affects nearly forty percent of all doctors in the United States. That’s a whopping ten percent greater than other professions! Frontline doctors – defined as those who work in family medicine, general internal medicine, and emergency medicine – are at highest risk. Tellingly, 45.8 % of physicians surveyed reported at least one symptom of burnout when assessed using the Maslach Burnout Inventory (MBI). Burnout is measured in three ways: (1) Emotional exhaustion; feeling helpless, trapped and defeated. (2) Detachment or depersonalization; treating patients indifferently along with increased cynicism. (3) Decreased in a sense of personal achievement and accomplishment. Your patients are bringing you chicken soup, and Kleenex has become your best friend. Do you suffer from frequent headaches, back pain, or muscle ache? Are you experiencing changes in appetite or sleep habits? Your chronic stress could be putting your health at risk. Manage stressors by starting your day with a few relaxation techniques such as deep breathing, stretching, meditating or yoga. Incorporate healthy eating, exercise and sleeping habits. Cognitive-behavioral and patient-centered therapy have also proven to help lower levels of emotional exhaustion and give you the wherewithal to face a challenging day. Your kids kiss a picture of you good night. You’ve been missing out on the pleasures of life that others enjoy, and your dog growls at you. You cannot remember the last time you went out with the family or even played tennis. Set personal boundaries. A healthy work-life balance is something you need to cultivate – surround yourself with loved ones and take the time to nurture your creative outlets. Most times, this can be achieved simply by scheduling the time off in advance. Have your administrator put all of your important events on a calendar and block out that time from your practice. Mergers and acquisitions are the new norm. Often, it is not patient care or long hours that cause the greatest amount of anxiety and stress in the workplace – it’s the environment. Unfortunately, there is little you can do to stop the mega-trend of increased consolidation. The good news: Some M & A’s and joint venture activities have been effective in reducing turmoil in the workplace. One successful hospital alliance restructured its clinics so that physicians could spend more time with patients and less time on the phone getting authorization from insurers. What can you do to help decrease the pandemonium that awaits in a newly formed partnership? Prepare meaningful workplace initiatives aimed at providing greater support for physicians while maintaining efficiency and lay a foundation for a common vision. Your semi-formal attire includes a mask and a cape. You are a crusader. You choose medicine to help people get better even if it kills you. The odds are that you’re a bit of a perfectionist, too. You might think: I can handle everything thrown at me. You are being bombarded during the day with emails, phone calls, drop-ins, and deadlines. While you may not have control over the interrupters, you can control your response by either accepting the interruption, cutting if off or diagnosing its importance and making a plan. Since many interruptions are recurring, have preset criteria for which response you want to make. Train those around you regarding the window of time that you will answer emails and take patient calls. Get comfortable closing the door when you need to focus. Oh, joy! You need to learn 100 new insurance codes replacing the ones you memorized yesterday. You’re feeling overwhelmed and underappreciated. In a fluid health-care environment, this comes with fast-changing priorities. It’s critical to define what’s truly important and why. It is equally important to reconnect with the reason you got into medicine in the first place. Both require clarity. It’s essential to understand your role in the organization, the company’s strategic priorities, and to regain that purposeful feeling of being a physician. Take a break from work or go on vacation to recharge and gain perspective. The world will not end while you’re away. We promise. Burnout won’t disappear if you ignore it. Left untreated, it can make you lash out at loved ones, turn to substance abuse, misdiagnosis and make medical errors, or worse. Keep the symptoms of burnout at bay by taking multidisciplinary actions that include stress management, reconnecting with family and friends, and making changes in your work environment. If it’s time for a job change – or if you just want to explore opportunities that are more aligned with your needs – MedSource Consultants can help. In response to the emerging burnout epidemic amongst physicians, we’ll do our very best to ensure that your next job is one where you are happy and satisfied for years to come.